If you have given online gaming a go in practice mode and have decided you would now like to move on to play for real money, read our detailed guide below which explains all you need to know about how to deposit money safely at an online casino. Deposit cash and you can play slots, blackjack, roulette, baccarat, poker and more all from the comfort of home. One of the standout features offered by online casinos is they provide the option of playing games for free in practice mode. Practice play allows you to sample as many games as you like, so you can get a feel for how the online play format works, learn how to play new games and familiarise yourself with the casino’s offerings before deciding if it’s worth your hard-earned money. The downside to practice play, of course, is it is not possible to win real money. Free play is perfect if you want to trial an online casino or if you are just a casual gamer looking to play for recreational reasons, but if you’re a gambler who wants to enjoy the thrills of a real cash wager, you will need to set up a real money account with your chosen online casino. 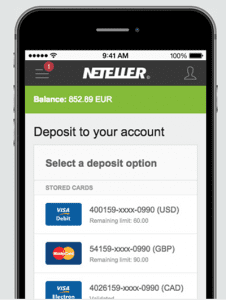 Details on how to deposit money safely to your Internet casino account are explained below. When you decide to play for real money, the first thing you need to do is select a reputable, trustworthy online casino that is worthy of your time and money. The variety of casinos available online is extensive, so there’s no need to settle for anything less than the best. When choosing an online casino, you want to pick a venue that’s licensed by a reputable gambling jurisdiction, with standouts being the UK, Malta, Curacao, Alderney, Gibraltar, Isle of Man and Kahnawake. Stick with casino sites independently audited by third-party testing agencies like eCOGRA or iTech Labs to ensure the gaming software is fair and tested, and choose casinos that offer a wide variety of games from leading software developers like Microgaming, NetEnt, BetSoft, iSoftBet, Quickspin, Play’n Go, Evolution Gaming and others. Check the website URL to make sure the casino is protected by SSL (secure socket layer) digital encryption security – you can identify this by making sure the web address starts with “https://” and displays an icon of a small padlock. To make it easy to identify the safe and trustworthy online casinos, we have extensively tested the leading venues to recommend our readers the top-rated casino sites. The casino tables on our website have been geo-targeted to recognise your location and only recommend reputable online casinos that accept players from your country. You can use our table to sign up for an account or read more about each casino. If you’re not familiar with the online gambling laws that apply to your country, we highly recommend you read our legal overviews as it is your personal responsibility to understand the online gambling laws that apply to you. Once you have chosen your preferred online casino, you need to register for an account in order to play for real money. Use any of the casino links on our site and you’ll be taken to a sign-up page where you can claim access to an exclusive welcome bonus that will give you incentives like matched deposit bonuses and free spins to get you started. Signing up for an online casino account is easy and will only take a few minutes. You will need to enter basic personal information like your name, email address, home address and date of birth, and create a username and password. If you intend to play for real money, it is vital you enter your correct details here, as the casino may require you provide proof of identification in the form of a driver’s license, passport or utility bill further down the track when it comes time to withdraw your winnings. If your sign-up details don’t match the identification you provide, the casino vendor has the right to refuse your payout. When registering, you may also be prompted to select your local currency. Choose carefully as this can be difficult to change once your account is confirmed. Most online casinos cater to a wide range of currencies, but be aware you may be subject to currency conversion fees when depositing and withdrawing money if you’re not using a common currency like USD, GBP, EUR, AUD or CAD. The deposit methods available vary between each online casino and differing online gambling laws mean not all payment methods are available to all players. To see what payment options are available to you, you can read the casino’s help guide, refer to the FAQ section or speak to a customer service rep using live chat. 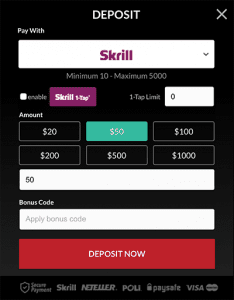 The easiest way to know exactly what deposit methods you can choose from is by signing into your account and going to the casino’s banking or cashier section, where you will be given a full list of all the online deposit options available to players from your country. To make your deposit, select from the deposit options on offer then follow the prompts to enter the amount of money you wish to transfer along with your payment information, and follow through to complete your transaction. Always check which payment options are available to you as there are some country-specific deposit methods that are only available to players from certain areas. 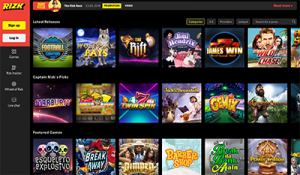 Most of the deposit options mentioned above are processed on the spot, so you can dive right in and start playing online casino games for the chance to win real money straight away. Be aware that deposits using bank transfers can take a few business days to process, so check the casino’s processing times to avoid any hold-ups. Once your funds have hit your account, you can now start placing real money bets on games like the slots, blackjack, roulette, video poker, baccarat, craps, poker, scratch cards and live dealer games. Every time you place a bet your casino account will be adjusted accordingly, with any wins you make being automatically credited back to your account, ready to be played with further or withdrawn. You’ll also start earning loyalty points for every real money bet placed, which can later be converted into rewards like bonus credits, free spins or cash prizes depending on the casino’s loyalty reward program. If you strike it lucky at the casino and your account gets a nice cash injection, making a withdrawal is easy, but there is a process to follow. To cash-out your funds, go to the casino’s banking section and select the withdrawal option. Here you will be given a list of all the available withdrawal methods, which may differ slightly to the deposit options. Select your payment method, enter the amount of money you wish to withdraw and follow the prompts to complete your request. Online casino withdrawals are subject to processing times as the vendor confirms and approves your request, with the processing times differing at each casino and for each payment method. Refer to the terms and conditions of your chosen casino site for full details about its withdrawal policy. Is it safe to deposit real money to an online casino? Depositing to play for real money online is entirely safe, provided you stick with reputable online casinos like those recommended on our site, all of which are protected by a minimum of 128-Bit SSL digital encryption security to protect players at all times. Stick with reliable payment methods like those mentioned above, and consider using an e-Wallet service or pre-paid card if you’re cautious about entering your credit card or bank details online. We also recommend the use of a trusted VPN (virtual private network) service to benefit from an extra layer of security when playing for real money online. Now that you understand the ins-and-outs of playing for real money at online casinos, why not give it a go by heading to one of our recommended casino sites and signing up for an account. Refer to our casino table above, which has been geo-targeted to recognise your location and only recommend safe, reputable online casinos that accept players from your area.